The Anglo-German team of Knight Architects and lead consultant Knippers Helbig has won a major international competition organised by the City of Vienna for an extraordinary new pedestrian bridge in the centre of Vienna. The 380m-long bridge at Margaretengürtel links recreational parkland to the west with Bruno- Kreisky Park to the east to provide a pedestrian friendly route across a busy traffic corridor. The linear form of the bridge evolves from the landscape at each end, establishing itself as a new topographic element. The continuous landscape-like object merges the previously disconnected parks into a single entity and the sculptural presence of the timber structure brings a distinctive new identity to the location. The bridge will be a major new element in an urban environment that includes the Margaretengürtel Station building by Otto Wagner (on the U4 U-Bahn Metro line) amongst its historic neighbours. The massive minimalism and formal simplicity of the new structure is considered in counterpoint to the rich architectural language of the neighbourhood. The fluid plan alignment follows a gently curved path, which observes strict constraints on where supports can be placed. The curve accelerates at mid span to create a sinuous ‘S’ form at its centre, and it is at this point that the two dimensional path evolves into a three-dimensional place, spanning across the main highway and tramway corridor with tall, asymmetric upstands on opposite sides of the bridge and seating set into the curving, banked sides. The solution deliberately explores a new direction in bridge structural form through the use of massive timber with minimalist detailing. The body is an efficient hybrid structure with a glulam core of spruce layers or ‘lamella’ of varying qualities, depending on the stress level in the particular location, and an outer layer covered by larch lamella which provides durability and good protection against moisture. The relatively large uni-axial bending radii of the glulam layers are easily achieved using standard production techniques. In areas of load transfer and peak stresses the timber will be reinforced with threaded steel rods laminated between the lamella. The factory-assembled units will be transported to site in manageable segments of up to 2m x 2m x 20m where they will be bolted together and installed onto insitu concrete plinths, which provide protection against highway impact. The robust construction method combines with the concept of a semi-integral bridge to significantly reduce maintenance costs. This innovative development of traditional timber building techniques demonstrates an approach to construction which is both spectacular and environmentally responsible, being both a carbon sink and an efficient use of resources. Using a locally common building material with a low processing cost, it is estimated the superstructure will contain approximately 795t of stored CO2 within the 960m3 of wood and will use a fraction of the energy in construction of a concrete or steel bridge of the same span. The design includes for a new social building beneath the western approach which, in its initial form, provides south facing steps that will act as both access and public space and serve to further root the crossing in the landscape. 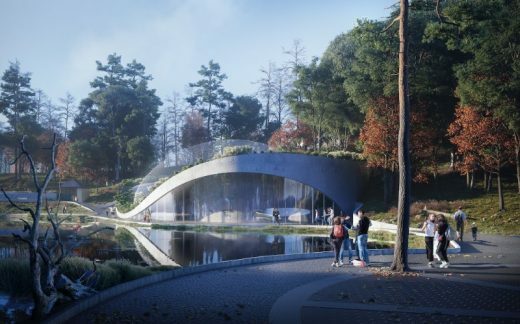 The Knippers Helbig / Knight Architects competition win follows their success in a 2009 competition for two 100m-long bridges at Opladen, near Leverkusen in Germany, which is progressing towards a construction start in late 2010. 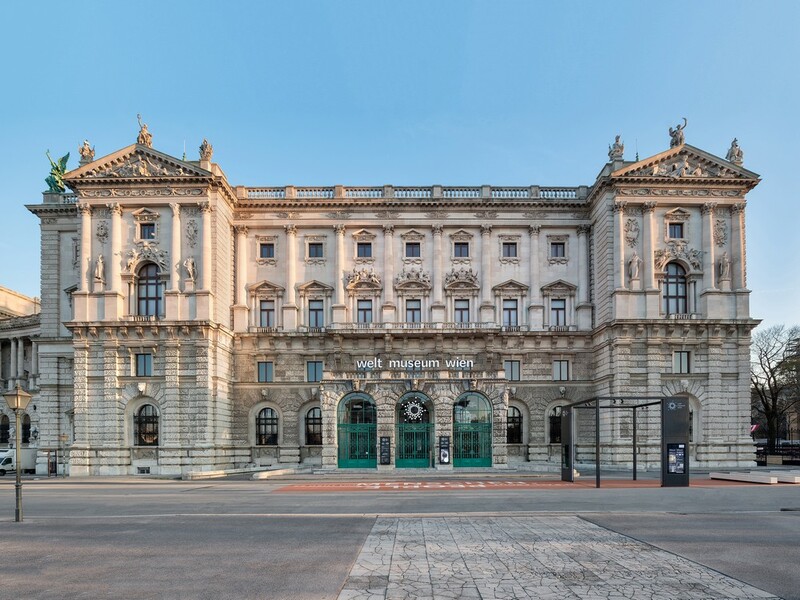 The competition-winning design is the latest in a series of collaborations between the Stuttgart and New York-based engineering practice Knippers Helbig and the British architectural practice Knight Architects. Founded in 2001 by Prof. Dr. Jan Knippers and Dipl.-Ing. Thorsten Helbig, the company specialises in the design and realisation of demanding German and international construction projects involving solid structures, timber and steel constructions for industrial and office buildings, public buildings, sports arenas, airports and bridges. With its focus on the development of special solutions for complex parametrical or generated geometries for steel and glass roof and façade constructions, as well as the use of innovative materials such as fibre-glass reinforced plastics, the office, together with Knight Architects, is currently working on the realisation of two bridge projects in Opladen, close to Leverkusen, Germany – a contract won in international competition in 2009. Established in 2006 and based in the South East of England, Knight Architects is a specialist architectural practice providing an international bridge consultancy based on the unique experience, skills and passion for bridge design that Martin Knight has built up over fifteen years in leading architecture and engineering practice. Knight Architects is responsible for the design of eight pedestrian and highway bridges as part of the £4bn Stratford City development in East London, including the striking new Town Centre Link, a 130m-long 12m-wide weathering steel structure spanning the railway lines at Stratford Station, due for completion in 2010. The work of his practice explores his belief that bridges are a very important component of the built environment – highly visible forms that have a significant impact on their locality – and that the architectural approach to bridge design is complementary to that of the structural engineer, where context, beauty, composition, scale and function are juxtaposed with fundamental engineering demands for safety, efficiency, economy, durability and constructability as the basis for lasting quality. Knight Architects, gegründet im Jahr 2006 im Südosten Englands, ist ein international agierendes Architekturbüro welches sich speziell auf Design und Beratung im Bereich von Brückenbauten festgelegt hat. Die Kompetenzen und die Leidenschaft auf diesem Gebiet hat Martin Knight in einem Zeitraum von über fünfzehn Jahren in führenden Architektur- und Ingenieurbüros gesammelt. Knight Architects sind veranwortlich für acht Fussgänger- und Strassenbrücken innerhalb des Ostlondoner Stadtentwicklungsprojektes Stratford City, welches ein Bauvolumen von 4 mrd. Pfund umfasst. Hierzu gehört auch das markante Projekt Town Centre Link, eine 130m lange und 12m breite Fußgängerbrücke aus wetterfestem Stahl, welche die Gleise des Bahnhofs Stratford Station überspannt. Die Eröffnung der Brücke soll noch in diesem Jahr statt finden. Bei Knight Architects ist man der Überzeugung, dass Brücken eine sehr wichtige Komponente der gebauten Umwelt sind – von weitem sichtbare Formen die einen signifikanten Einfluss auf ihre Umgebung haben. Die architektonische Herangehensweise an einen Brückenentwurf ergänzt sich mit dem eines Tragwerksplaners. Nur wenn Kontext, Schönheit, Komposition, Größenverhältnis und Funktion sich mit den Anforderungen an Sicherheit, Effizienz, Nachhaltigkeit und Baubarkeit die Waage halten, kann eine dauerhafte Qualität erreicht werden.